1 The title changed from "Colonial Secretary" to "Chief Secretary" in 1976. 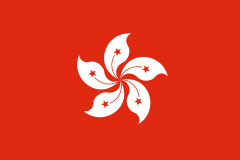 British Hong Kong (Chinese: 英屬香港; Jyutping: jing1 suk6 hoeng1 gong2) was the period during which Hong Kong was under British Crown rule from 1841 to 1997 (excluding the Japanese occupation from 1941 to 1945). It was established as a Crown colony and later designated a British Dependent Territory in 1981. 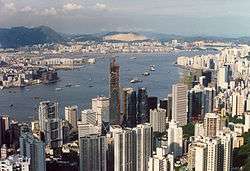 Hong Kong Island was ceded to Great Britain by the Qing dynasty of China after the First Anglo-Chinese War (1839–42). The Kowloon Peninsula was added to the colony after the Second Anglo-Chinese War (1856–60). Finally, in 1898, the New Territories were added under a 99-year lease. 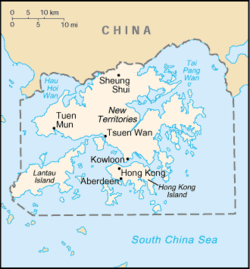 Although Hong Kong Island and Kowloon were ceded to Britain in perpetuity, the New Territories – which comprised over 90 per cent of Hong Kong's land – had such a vital role in the economy that the British government agreed to transfer sovereignty of the entirety of Hong Kong to People's Republic of China upon the expiration of the lease in 1997. In September 1839, the British Cabinet decided that the Chinese should be made to pay for the destruction of British property, either by threat or use of force. An expeditionary force was placed under Elliot and his cousin, Rear Admiral George Elliot, as joint plenipotentiaries in 1840. Foreign Secretary Lord Palmerston stressed to the Chinese Imperial Government that the British Government did not question China's right to prohibit opium, but it objected to the way this was handled. He viewed the sudden strict enforcement as laying a trap for the foreign traders, and the confinement of the British with supplies cut off was tantamount to starving them into submission or death. He instructed the Elliot cousins to occupy one of the Chusan islands, to present a letter from himself to a Chinese official for the Emperor, then to proceed to the Gulf of Bohai for a treaty, and if the Chinese resisted, blockade the key ports of the Yangtze and Yellow rivers. Palmerston demanded a territorial base in Chusan for trade so that British merchants "may not be subject to the arbitrary caprice either of the Government of Peking, or its local Authorities at the Sea-Ports of the Empire". In 1841, Elliot negotiated with Lin's successor, Qishan, in the Convention of Chuenpi during the First Opium War. On 20 January, Elliot announced "the conclusion of preliminary arrangements", which included the cession of Hong Kong Island and its harbour to the British Crown. On 26 January, the Union Jack was raised on Hong Kong and Commodore James Bremer, commander-in-chief of British forces in China, took formal possession of the island at Possession Point. 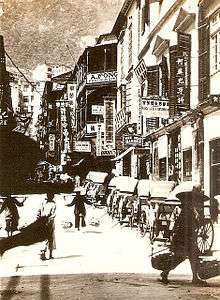 Elliot chose Hong Kong instead of Chusan because he believed a settlement further east would cause an "indefinite protraction of hostilities", whereas Hong Kong's harbour was a valuable base for the British trading community in Canton. On 29 August 1842, the cession was formally ratified in the Treaty of Nanking, which ceded Hong Kong "in perpetuity" to Britain. In 1941, during the Second World War, the British reached an agreement with the Chinese government under Generalissimo Chiang Kai-shek that if Japan attacked Hong Kong, the Chinese National Army would attack the Japanese from the rear to relieve pressure on the British garrison. On 8 December, the Battle of Hong Kong began when Japanese air bombers effectively destroyed British air power in one attack. Two days later, the Japanese breached the Gin Drinkers Line in the New Territories. The British commander, Major-General Christopher Maltby, concluded that the island could not be defended for long unless he withdrew his brigade from the mainland. On 18 December, the Japanese crossed Victoria Harbour. By 25 December, organised defence was reduced into pockets of resistance. Maltby recommended a surrender to Governor Sir Mark Young, who accepted his advice to reduce further losses. A day after the invasion, Generalissimo Chiang ordered three corps under General Yu Hanmou to march towards Hong Kong. The plan was to launch a New Year's Day attack on the Japanese in the Canton region, but before the Chinese infantry could attack, the Japanese had broken Hong Kong's defences. The British casualties were 2,232 killed or missing and 2,300 wounded. 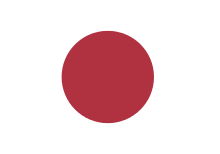 The Japanese reported 1,996 killed and 6,000 wounded. The Japanese imprisoned the ruling British colonial élite and sought to win over the local merchant gentry by appointments to advisory councils and neighbourhood watch groups. The policy worked well for Japan and produced extensive collaboration from both the élite and the middle class, with far less terror than in other Chinese cities. 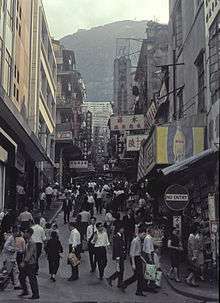 Hong Kong was transformed into a Japanese colony, with Japanese businesses replacing the British. However, the Japanese Empire had severe logistical difficulties and by 1943 the food supply for Hong Kong was problematic. The overlords became more brutal and corrupt, and the Chinese gentry became disenchanted. With the surrender of Japan, the transition back to British rule was smooth, for on the mainland the Nationalist and Communist forces were preparing for a civil war and ignored Hong Kong. In the long run the occupation strengthened the pre-war social and economic order among the Chinese business community by eliminating some conflicts of interests and reducing the prestige and power of the British. On 14 August 1945, when Japan announced its unconditional surrender, the British formed a naval task group to sail towards Hong Kong. On 1 September, Rear Admiral Cecil Harcourt proclaimed a military administration with himself as its head. He formally accepted the Japanese surrender on 16 September in Government House. Sir Mark Young, upon his return as Governor in early May 1946, pursued political reform known as the "Young Plan", believing that, to counter the Chinese government's determination to recover Hong Kong, it was necessary to give local inhabitants a greater stake in the territory by widening the political franchise to include them. The handover ceremony was held at the new wing of the Hong Kong Convention and Exhibition Centre in Wan Chai on the night of 30 June 1997. The principal British guest was Charles, Prince of Wales who read a farewell speech on behalf of the Queen. The newly appointed Prime Minister of the United Kingdom, Tony Blair, the British Foreign Minister Robin Cook, the departing Hong Kong governor Chris Patten, General Sir Charles Guthrie, Chief of the Defence Staff of the United Kingdom also attended. A BDTC passport issued to Hong Kong permanent residents with British Dependent Territories Citizenship before 1997. On 1 July 1997, all Hong Kong residents lost their BDTC status and most acquired Chinese nationality. In January 1841, when Elliot declared Hong Kong's cession to Britain, he proclaimed that the government shall devolve upon the office of Chief Superintendent of British Trade in China. He issued a proclamation with Commodore Bremer to the inhabitants on 1 February, declaring that they "are hereby promised protection, in her majesty's gracious name, against all enemies whatever; and they are further secured in the free exercise of their religious rites, ceremonies, and social customs; and in the enjoyment of their lawful private property and interests." Elliot declared that Chinese natives would be governed under Chinese laws (excluding torture), and that British subjects and foreigners would fall under British law. However, London decided that English law should prevail. 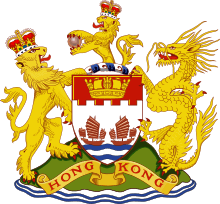 The Letters Patent of 5 April 1843 defined the constitutional structure of Hong Kong as a Crown colony and the Royal Instructions detailed how the territory should be governed and organised. The Letters Patent prescribed a Governor as head of government, and both the Executive Council and Legislative Council being advisors to the Governor. The administrative civil service of the colony was led by a Colonial Secretary (later Chief Secretary), who was deputy to the Governor. For almost all of its history under British rule, executive power in Hong Kong was concentrated in the hands of the colony governor, a position appointed by the British crown without any democratic input from Hong Kong citizens. The introduction of elected representatives determined by local elections, even limited to the role of "advisory councils", did not begin until after the 1984 agreements by the British to hand Hong Kong over to China. The stability, security, and predictability of British law and government enabled Hong Kong to flourish as a centre for international trade. In the colony's first decade, the revenue from the opium trade was a key source of government funds. The importance of opium reduced over time, but the colonial government was dependent on its revenues until the Japanese occupation in 1941. Although the largest businesses in the early colony were operated by British, American, and other expatriates, Chinese workers provided the bulk of the manpower to build a new port city. 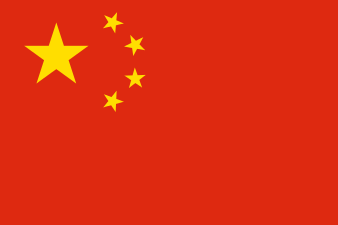 There was considerable opposition from Chinese nationalists to the British rule due to its implications for Hong Kong self-determination, particularly in the political arena. Early dissent such as the Canton–Hong Kong strike were anti-British and anti-imperialist in nature. 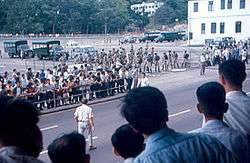 Later, the 1966 riots and the 1967 Leftist riots were large scale demonstrations against British colonial rule that was fuelled by tensions surrounding labour disputes and dissatisfaction towards the government. During this period, groups such as the Anti-British Struggle Committee were established for the purpose of targeting the British Colonial government. While primarily organised by pro-Communist members and sympathizers from the mainland, the anti-British movement also garnered local support. ↑ No specific variation of Chinese was mentioned in the Official Languages Ordinance but Cantonese was de facto official since 1974. 1 2 3 The Chinese Repository. Volume 10. pp. 63–64. ↑ Belcher, Edward (1843). Narrative of a Voyage Round the World. Volume 2. p. 148. ↑ Philip Snow (2004). The Fall of Hong Kong: Britain, China and the Japanese Occupation. Yale U.P. p. 81. ↑ Cheung, Gary Ka-wai (2009). Hong Kong's Watershed: The 1967 Riots. Hong Kong University Press. Snow, Philip (2004). The Fall of Hong Kong: Britain, China and the Japanese Occupation. Yale University Press. ISBN 0300103735. Tsang, Steve (2004). A Modern History of Hong Kong. I. B. Tauris. ISBN 978-1-84511-419-0. Tsang, Steve (1995). Government and Politics: A Documentary History of Hong Kong. Hong Kong University Press. ISBN 962-209-392-2. "Official web site of the British Hong Kong Government". Archived from the original on 24 December 1996. Retrieved 2013-03-26.